I came, I saw, I floated. As I’d mentioned in part 2 of this article, I was interested in going to a float spa to reset my brain after an incredibly stressful few months. What I didn’t mention was the “other” effects I’d heard and read about in various articles from the mental health community and here and there from those with parapsychology backgrounds. Among the benefits of bringing the brain into a theta state are noted some side-effects that are a little more in the category of Stranger Things, such as hearing voices, lucid dreaming and hallucinations. Many have claimed to have had these experiences and it’s not total science fiction. In the absence of external stimuli, the brain starts to generate its own information. Much of what we perceive as reality is verified by information in our environment. An example would be perceiviing it is late afternoon by the position of the sun in the sky or the direction a scent is coming from by the feel of the wind blowing. Without these outer clues, the brain doesn’t have a way of validating information and that’s where delusional thoughts and hallucinations can come in. But anything truly harmful to that extent would be after a very long time of sensory deprivation, not an hour here or there as you’d have in a float spa (indeed, the US government has studied extensively just how long that is). Yet we’re all very individual and our brains have their own timing as far as how long it takes to produce such content. And of course medications and sleep and stress all alter our brain’s effectiveness. So while I knew I wasn’t going to reach out and touch the Upside Down, I wasn’t opposed to a little “wooooooooo-ooooo” either. My appointment was for 2 pm. I’d drank my cup of coffee at 10am, ate some granola and later some candy on the way to the spa becuase it was Saturday and I’ll eat what I want, thanks. I was welcomed at the spa, shown the video and taken back to a long, low-lit hallway to the pod room. Much larger than i was expecting, the room was tiled and equipped with a bench, the float pod, hooks to hang my things on and a shower with soap, shampoo and conditioner. I was given a little floating “halo” to lay my head in and shown the controls on the pod which included an intercom in case I needed to ask questions and a light control for the actual pod which had a coloured ambient light. I had brought a bathing suit but at the last moment decided to go in my natural state after I showered because totally frankly, I was too lazy to change and who’s going to see anyway (I did a paranoid check of the corners for cameras and I’m not ashamed of that)? The pod itself looked like something I might take off in space in, slick and round and future-looking. The top could be closed to encase me completely or left totally open or propped open just a bit with a rolled up towel. It was also fitted with a squirt bottle of fresh water for my face in case I somehow got salt water on my face. It just so happened that I’d burnt my skin around my eye the week before with a splash of hot soup (don’t ask) so I was glad to see some real water. I was given ear plugs, makeup wipes and vaseline and after my shower I eyed up the pod for a moment because I also have a thing about my feet touching the bottom of the pool. Using deep breathing, I quickly slid into the pod and floated with my arms and legs splayed out. What I thought was going to be easy proved way harder than I’d thought. Like the video said, the areas where I have Fibromyalgia pain screamed out and I panicked, thinking i wouldn’t be able to stay still long enough to do anything. The staff girl had told me I could use the halo to lay my head in and relax my neck because people automatically tense their necks when they try to float. But in water so dense with salt you don’t need to “try” to keep yourself above water, it just happens. I got back out and grabbed the halo, slipped it around the back of my head and immediately relaxed. It was amazing how my body just fanned itself out without my needing to convince it to. For the first five minutes ambient music played, which allows you to get into a comfortable position. You want to remain as still as possible during floating to prevent the movement of the water around you from becoming a stimulus in itself. Going in I thought I’d never be able to do it because I have a lot of involuntary movement during the day and definitely during sleep in my hands and legs (though not Restless Legs Syndrome). During that first five minutes, my fingers had a field day twitching along as I kept thinking, This isn’t working, This isn’t working. After the five minutes was up the music turned off and the lights turned off. Some spas give you goggles or an eye mask to help with the darkness but this spa didn’t. I get those annoying twitches in my eyelids as well so when the light went out I had to concentrate on keeping my eyes closed and while I did that my arms, hips and legs relaxed and I was amazed at how tense my knees had been. Here’s where some people use meditation to calm their thoughts. For myself, concentrating on my breath is as far as I can get. I breathe in while counting 1-2-3-4, then breathe out counting 5-6-7-8. It’s totally normal to get sidetracked in thoughts and I did pretty quickly, thinking about work and dinner and stopping at the garden shop on the way home. In meditation one gently lets those thoughts go and just goes back to counting and breathing or focusing on a mantra. Sometimes I even got distracted counting from 1 to 2! Now I was really rather scared about being still for so long. What the hell was I going to do? But thankfully the process of focusing on breathing took away any sense of time. 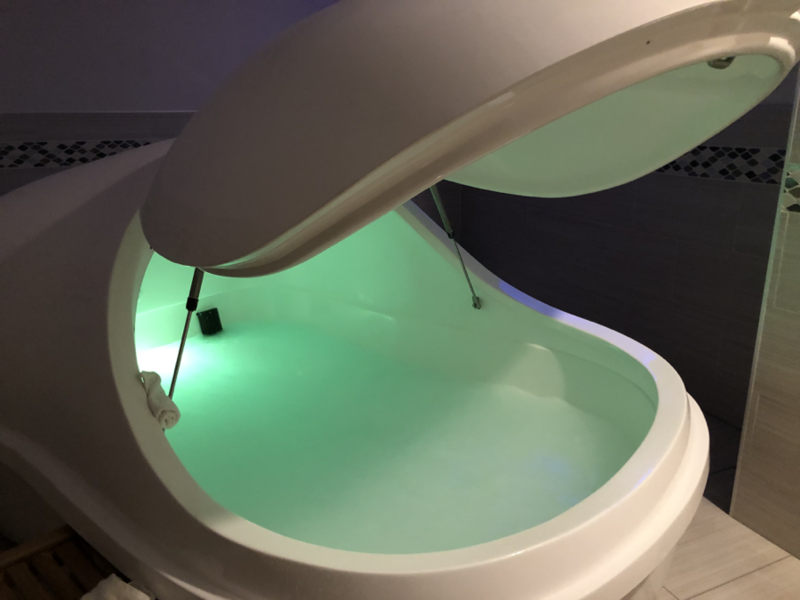 My other huge concern had been the water temperature but it was body temperature- completely relaxing and the room itself was so warm I left the pod door open for the session because I found I had to focus on breathing to cope with that. After a short time I began to lose feeling in my body- not in a “went to sleep” sort of way but rather in that I could no longer tell if I was in water or not, if I was clothed or not. At some point I felt like I was just existing in the air, totally unaware of being “wet.” My twitches and movements were gone, all pain was gone. While I could hear on occasion a door opening down the hall (it’s pretty hard to get rid of all sound outside of a lab), the earplugs did an excellent job of blocking out sound. I was able to see the emergency exit light over the door which was distracting and why next time I’ll close the pod. But I was aware of transient images that floated across my eyes here and there. They were disjointed, not like dreams but more like intrusions of someone in my own brain. There was an old woman who appeared and turned her head, a man with a suit, a pair of eyes behind glasses. I’ve read accounts of seeing shapes and I did see some of those and also little sparkles and shooting star-like visions. All in all this was a very pleasant experience only punctuated by one really odd instance: I could hear random sounds llke metal clanging and animals screeching. These were inside my head but still detectable by my ears. I wasn’t unsettled by them until I heard very clearly a man’s voice say into my right ear “Hello.” At that point I very nearly got out of the pod but I calmed myself, reminding myself that G-d is always here with me and finished the session a little wary by what had happened but all the more curious to go back and find out what else is to be heard. Afterwards I showered and found that my body felt that delicious way of calm and sleepy one feels after swimming all afternoon or having a really good workout. The muscles in my legs were heavy and pain-free and I just wanted to sleep. I didn’t take any oxygen or tea but next time I might. Floating is one of those things you get more benefits (I’m told anyway) as you get more sessions in and the jury is out on the frequency- some say go weekly, some biweekly, some monthly. Since I didn’t want to plunk down a bunch of cash on something there was a possibility I’d flake out on, I scheduled just one more session for now. But I’ll definitely be going back in April so tune in for my next report!